Spectre Polished Performance Air Intake 02-08 Dodge Ram 5.7, 4.7 Spectre Polished Performance Air Intake 03-08 Dodge Ram 5.7L, Spectre Polished Performance Air Intake 02-07 Dodge Ram 4.7L, Spectre 9932 Intake System, Dodge Ram Spectre Intake, Dodge Ram Cold Air Intake, Dodge Ram Intake, Dodge Ram Intake System [Spectre 9932 Intake System] - $198.95 : 3rd Strike Performance, Your Source for Late Model MOPAR Performance Parts and Accessories! 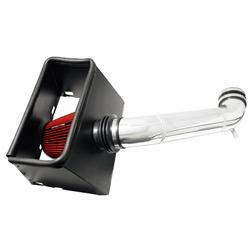 Spectre Performance air intake systems provide better acceleration and fuel economy for your truck or SUV. They're designed to replace your factory air filter and air box assembly, getting rid of the restriction as they smooth and straighten airflow. The high-flow design of these intakes enables your engine to breathe in a larger volume of air, resulting in more usable power throughout the engine's entire rpm range. Hundreds of models are available, with various tube and filter options. Choose the kit tailored for fitment and performance on your make/model. Intake Pipe Color/Finish: Polished or Custom Powdercoated Due the nature of Candy coatings, there may be some variation in the color. This in now way means the coating is bad. Candy coatings are very dependent on the condition of the tubing coated and the application process. Please bear this in mind when selecting Candy colors. Add a pre-filter wrap for the ultimate protection for your engine! They are especially helpful in dusty areas. Pre-filter wraps provide added protection to the filter against water, moisture, and dust. Further ensure the cleanest air possible is supplied to the intake system.